Hakkake is a kind of back fabric of kimono, which is used in the area near the edge of a lined kimono. Different from European clothes, you can see Hakkake exposed a little from the front. This is for protecting edges of kimono which are easy to get worn. Hakkake of hems and cuffs will get worn first. Old Hakkake will be replaced with a new one at a specialty store. Several kinds of fabric will be used for Hakkake: general fabric for Hakkake, self fabric and special fabric for front. There is a custom that self fabric is used for formal kimono. 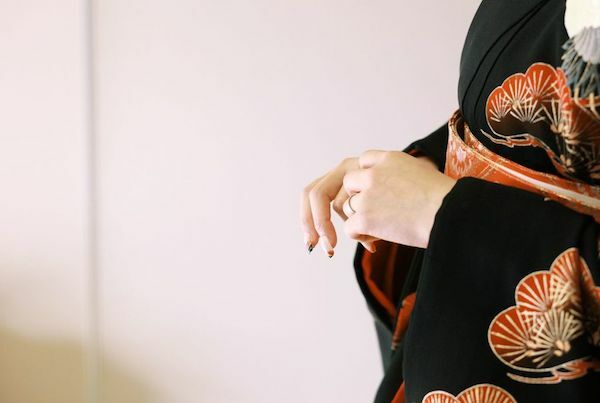 Both the self fabric and another fabric are used in other kimonos. There are hakkake of monotone color and gradation color. Hakkake of gradation color is called “bokashi hakkake”. This is for keeping the boundary line of hakkake and dori from falling on the front fabric of faint color. You can decide which hakkake to use on your preference because there is no rule. The color of hakkake will make effect on the impression of kimono. This is why sometimes people change hakkake which is still unworn, when they get tired of it.